Special Supplies Kid’s Rubber Bouncy Chair Bands (12-Pack) Promotes Calming Focus, Fidget & Stress Relief | Supports Sensory Needs for ADHD, ADD, SPD, Autism | Fits Classroom Desks by Special Supplies at Get Cheap Health Insurance. MPN: cb12. Hurry! Limited time offer. Offer valid only while supplies last. Support Child Focus & Clarity - This small desk bouncy chair bands designed for school class rooms help young children release energy while improving mental acuity. Ultra-Quiet and Discrete - Crafted with a flexible, thick rubber, kids can bounce these chair bounds without causing distraction, making noise, or getting up. Quick, Simple Installation - These fidget bands for desk chairs simply wrap around the legs of the chair (10" to 24") without requiring tools or complicated instruction. Long-Lasting Durability - The heavy-duty rubber provides a firm, yet flexible bounce that gives the right amount of resistance, superior strength and resilience. 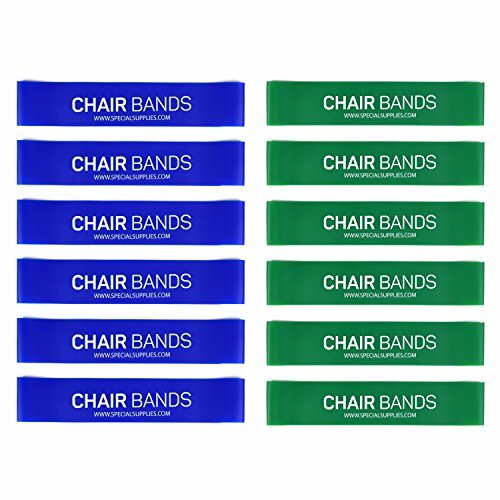 Guaranteed Quality - This 12-pack of rubber bands for chairs is backed by reliable craftsmanship and consistent quality you can trust, all backed by brand assurance. View More In Sensory Motor Aids. If you have any questions about this product by Special Supplies, contact us by completing and submitting the form below. If you are looking for a specif part number, please include it with your message.